In his first NFL start, Green Bay quarterback Brett Hundley showed the feet that helped him become the second-leading rushing quarterback in UCLA history, but he didn’t unleash the arm that owns his alma mater’s record in passing touchdowns. 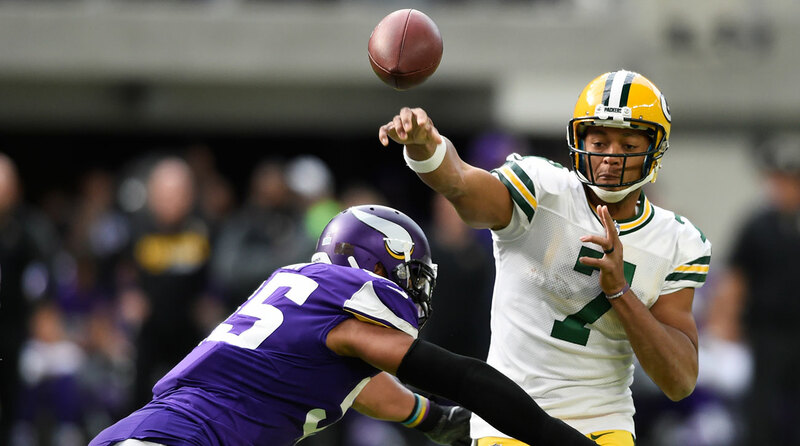 Hundley rushed for 44 yards on three carries with a 14-yard touchdown in Green Bay’s 26-17 loss to the New Orleans Saints last Sunday, but threw for only 87 yards on 12-for-25 passing with one interception. 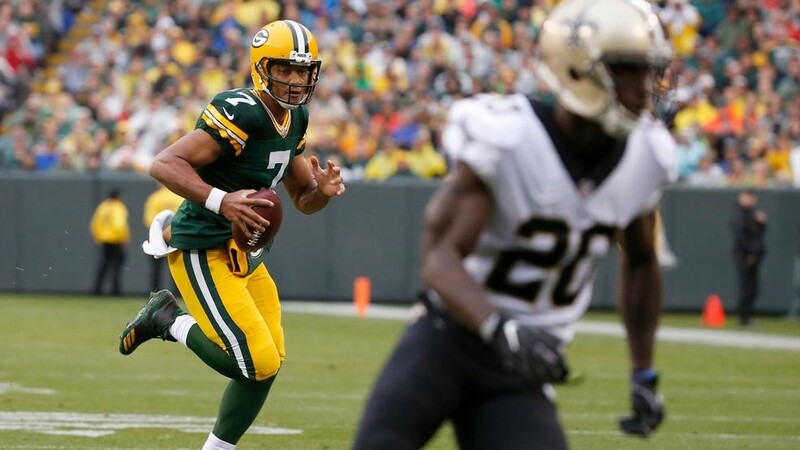 #Packers QB Brett Hundley scrambles for a 14 yard TD! The Saints scored 10 unanswered points in the fourth quarter to pull away late. Aaron Rodgers is out indefinitely with a broken collarbone, but in his third year behind the star quarterback, Hundley is confident he can improve on his first start. “I’ve been learning from [Rodgers] for three years and all I have to say is, don’t write us off,” Hundley told reporters. “I think that’s the biggest thing. We’ve got to get better and we will get better, but we’re not out [of it]. Eric Kendricks had a team-high 13 tackles and three tackles for loss. The two UCLA linebackers combined for 24 tackles. Eli Ankou is now a formal resident of “Sacksonville” after the Jaguars rookie tallied his first NFL sack last Sunday against the Colts. He had two tackles and a half-sack in Jacksonville’s 27-0 win. The Jaguars had 10 sacks and are on pace to break the NFL record. Fellow former Bruin Myles Jack had one sack Sunday. Fabian Moreau injured his hamstring during Washington’s Monday Night Football loss to the Eagles. Paul Perkins has missed three straight games for the New York Giants with a rib injury. He had only 32 carries for 61 yards this season. Cassius Marsh blocked a field goal for the Patriots in their win over Atlanta. Former UCLA linebacker Myles Jack scored a touchdown on an 82-yard fumble recovery on Sunday in Jacksonville’s 23-20 overtime loss to the New York Jets. The second-year linebacker has 26 tackles and one sack this season. In the above video, you can see fellow former Bruin Eli Ankou join the celebration in the end zone. Ankou spent the preseason with the Houston Texans as an undrafted free agent, but was claimed off waivers by the Jaguars right before the season started. Ankou has six tackles in four games. From the weird-news department: People were bidding thousands of dollars on eBay for Takk McKinley‘s dreadlock. Former UCLA defensive tackle Eddie Vanderdoes not only got the start for the Oakland Raiders in his NFL debut, but he got four quarterback pressures and two hits against the Tennessee Titans, according to Pro Football Focus. 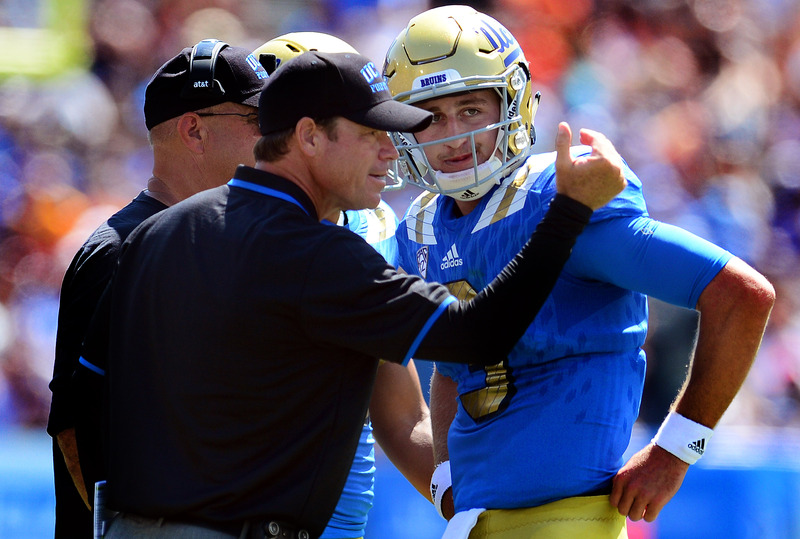 Much has been made of UCLA starting a true freshman quarterback in Josh Rosen, something that had loomed as the biggest question of the Bruins’ offseason. Rosen has looked more than capable through his first two games, throwing for 574 yards, four touchdowns and an interception. According to Mora, the five-star recruit out of Bellflower St. John Bosco is in a much better situation than he might be in three or four years from now. Mora was the defensive backs coach in San Diego when the Chargers started Billy Joe Tolliver for five games in 1989. The second-round draft pick took the No. 1 job midway through Jim McMahon’s disappointing season, and completed 89 of his 185 passes as a rookie for 1,097 yards, five touchdowns, and eight interceptions. The next year, rookie John Friesz started the regular-season finale for the Chargers, recording 98 yards, a touchdown and a pick on 50 percent passing in a 17-12 loss to the Oakland Raiders. The sixth-round draft pick became a full-time starter in 1991, Mora’s last year on the San Diego staff.